Share "Selecting The Right Pet Bird For Kids"
Are you thinking about getting a pet bird for the kids? Birds are fascinating creatures and serve as great pets. In general, there are a handful of breeds that are perfect for children due to their intelligence, sweet personalities, and general temperament. The real trick is selecting a bird that enjoys being handled and teaching your kids how the proper way to take care of it. Birds are sensitive animals and require an environment with steady temperature, high air quality, and a superior diet otherwise they could get hurt. Take a dive into this article to learn more about the different breeds that could be the right bird for your kids to have as pets. Some popular bird species that serve as great pets include canaries, finches, cockatiels, parakeets, parrots, and lovebirds. Before selecting the right bird make sure you have an idea of how much time you can devote to the bird and how often you think your kids would like to handle it. For some people, birds add beauty and music to their home, but for others they really do become true companions. For example, finches and canaries generally don’t like being handled by humans, but prefer to be in a small flock and like to fly around. Make sure to grab more than one so that the bird has an additional friend that’s not human and a flight cage so that the birds have the freedom to move around. These birds serve as great pets for younger children as the child is too young to handle the bird and they provide soothing music through their soft chirps and chatter for everyone to enjoy. 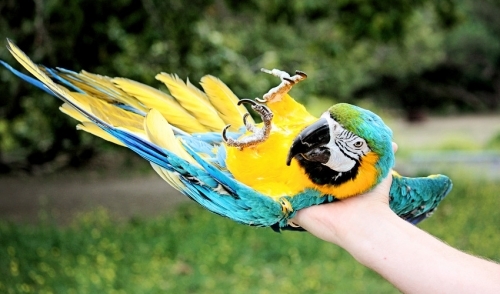 Similar to fish, these birds are more suitable for watching than being petted or handled. Another great bird for kids is the parakeet. Unlike finches and canaries, parakeets enjoy being handled and can be very gentle with their owners. Their personality can be described as kind or soft and the bond they can form with kids is almost unparalleled. A bonus to having a parakeet as a pet is that they can learn to talk. Parakeets are a larger species of bird and will require a mixed diet of veggies, formulated pellets, and seed. Encourage your kids to use positive reinforcement to help train these birds to talk and be wonderful companions. For kids that are slightly older, I recommend selecting cockatiels. Cockatiels are another large species that make great pets. Cockatiels can talk, whistle, and even do tricks. These birds love to interact with people and are a delight for kids to work with. Cockatiels are very similar to your typical household pet like a dog or cat. They require attention, special care, and a life outside of the cage in order to have a happy experience. With all of this in mind, cockatiels are great for older children as they can help develop character and responsibility for your child. Other birds like parrots are similar but require even more attention and interaction outside the cage which may not be suitable for your child depending on their age. Make sure to speak to your local pet store about any particular species to understand its required living conditions. A bird must be supported by the proper environment in order to be happy and thrive. Some birds can become depressed if the relationship between owner and bird is neglected. The price of a small bird is also not entirely cheap, however there are ways to adopt to give a bird in need a loving home. Birds are beautiful creatures and delightful pets. Your kid will be lucky to have one to call its own.